It was exactly 50 years ago that the Summer of Love took place. In California and to a lesser extent Britain, thousands of teenagers decided that “Love is all you Need” and became Hippies, wearing multi-coloured psychedelic clothes and putting flowers in their hair, which was always grown long. The ready availability of drugs such as LSD persuaded many that there was an alternative reality to the Capitalism of the older generation. 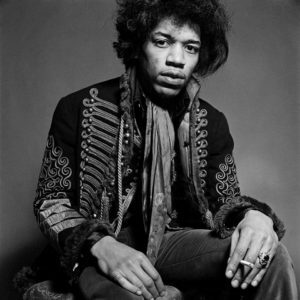 The first Pop Concerts were invented and there were new music icons such as Jimi Hendrix (who I met in 1967). The anthems of that summer included “A Whiter Shade of Pale” and Scott Mackenzie’s “San Francisco” with its famous advice that visitors to the city should wear flowers in their hair because they would meet “some gentle people there”. It didn’t last of course. The fantasy that young people could change the world by Making Love not War soon faded in the face of the realities of the Vietnam War and the Soviet Union brutally crushing hopes of democratic reforms in Czechoslovakia. And with the benefit of hindsight we can see that many of the roots of the Counter-Culture of 1967 went back many years to Germany. Gustav Nagel can claim to be the prototype of the Hippies. He was born in 1874, the son of Middle-class German parents. Already as a teenager he was putting forward his ideas. 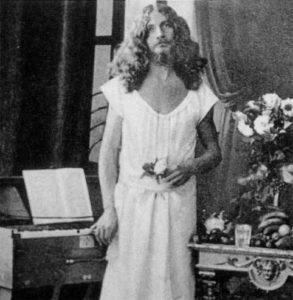 He grew his hair and beard long in a conscious imitation of Jesus, and took to wearing dresses or caftans. He mostly went barefoot and never wore shoes. He became a strict vegetarian and wandered around the countryside preaching a back-to-nature lifestyle. Later he established what we would now call a commune for his followers. He argued for (and practised) free love for his disciples. He formed his own political party but, unsurprisingly, never won a seat in the Reichstag. When the Nazis came to power, they disapproved of his undisciplined lifestyle, closed down his Commune and threw Vogel into a Concentration Camp. He survived the war and died in 1952. He was never called a Hippie- the word did not become used until after his death- but nevertheless there is a link between him and San Francisco of 1967. This is because Vogel helped inspire a Back-to-Nature youth movement in Germany called the Wandervogel (“The Wanderers”) from 1900. Groups of male teenagers would wander the countryside, living rough but enjoying the freedom. Invariably one of them would bring his guitar on their hikes to entertain the others as they sat round their camp fire and their tents. During the1920s some of the Wandervogel emigrated to the USA. A large group moved to California where it was easy to continue their back-to-nature lifestyle. In turn, some young Americans started to copy this lifestyle, calling themselves the Nature Boys. They grew organic food, opened the first Health Food shop in the world and dreamt of a world without money, jobs, Industry and cities. There were other reasons why the Summer of Love took place in 1967. The Civil Rights Movement led by Martin Luther King had inspired young people across the USA to take part in demonstrations and political activity. By 1966 it looked as if they had won that battle and the newly politicised generation turned to opposing the Vietnam War. At the same time there was a massive expansion in Higher Education. Universities like Berkeley in California were huge with 30,000 students, and they became frustrated at huge impersonal lectures and the way University authorities refused to allow protest demonstrations. From 1964 student activists were looking for an alternative to this impersonal education. Finally, there was the ready availability of drugs. In 1967 students discovered LSD, which was now being produced in large quantities. In the Haight-Ashbury district of San Francisco, the Nature Boys were able to spread their Gospel of a completely different lifestyle, rejecting governments, wars, laws, traditional education and their parents’ way of life. Stalls offered free food and clothes to everyone, the first Pop Concert at Monterey was organised. Large numbers of young people followed Scott Mackenzie’s advice and moved to San Francisco to get a taste of this counter-culture. The Summer of Love did not last long, but greatly influenced popular music and fashions. The Hippies were idealistic and naïve and, inevitably, became disillusioned when they failed to turn Flower Power into a reality. But Gustav Nagel would have been pleased that at long last someone had actually put his eccentric ideas into reality. Previous articleNaturally Nourished – Herbs GALORE…..